The last time I bought Bottega Veneta shoes was 2006. The best leather loafers from Spring. Same style in all colors... I am loving it. Right now, I am going back to Bottega Veneta for my must have sandals. 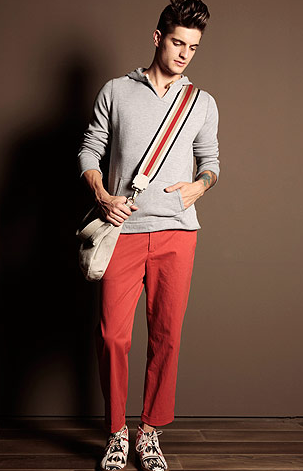 You can pair it up with capris, linen shorts, tight trouser with Liberty of London shirt. Thank God they carry size 39 shoes. 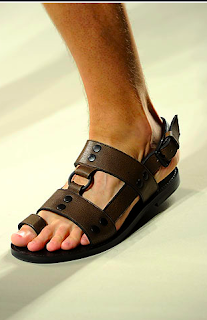 I will have these sandals. 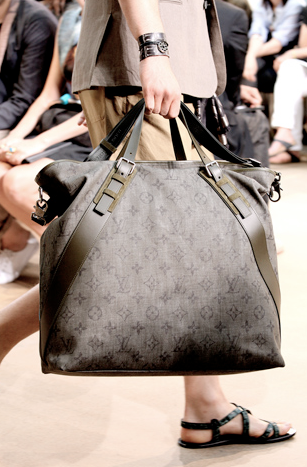 I am not a big fan of screaming logos, but this Louis Vuitton bag is exceptional. The monogram version does not scream tackiness. 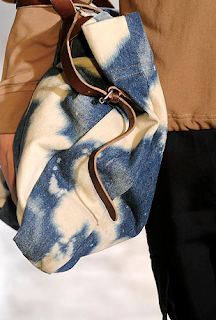 It looks like this tote was dug up from the Titanic. It is simply amazing. The muted monogram depicts the vintage says VINTAGE print to me!!! Christopher Bailey of Burberry knows how to wow the audience with his latest Spring/Summer 2011 men's collection. He showcased different variations of coats and jackets: military, bikers, and fitted trench coat. What caught my eye? A fitted leather butter colored jacket. I must have this. 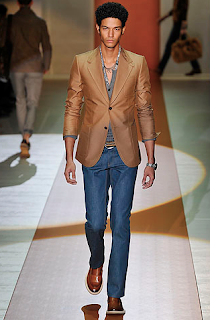 My obsession for Spring/Summer 2011 continues. 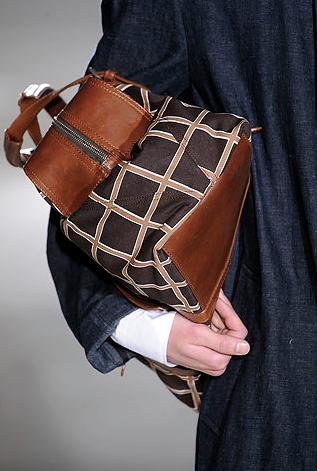 Burberry never fails. 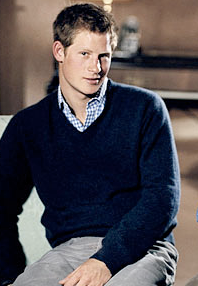 DO YOU KNOW WHERE PRINCE HARRY STAYS IN NEW YORK? He is here for the 2010 Veuve Cliquot match at Governor's Island. Tomorrow is the match. I wish him all the luck. Dries Van Noten is the best menswear designer in the fashion industry. I have been an avid follower of his evolving collection for 10 years. He is the master of prints. For next season, I am wishing buyers from Barneys New York, Bergdorf Goodman, and Browns of London will be buying these amazing bags. I must have them. I am keeping my fingers crossed. I hope these buyers hear my plea. I love how the Europeans dress up... effortless and chic. For Spring 2011, designers are still referencing the 80s and the 60s. Versace hired a new creative director for their men's division. 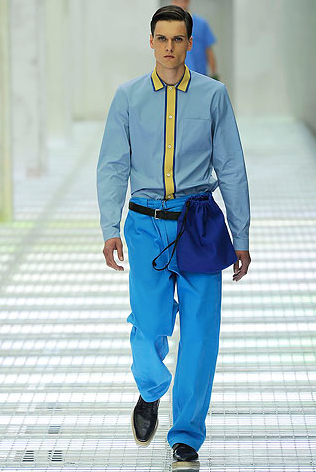 Martyn Bal made the house of Versace younger and edgier. 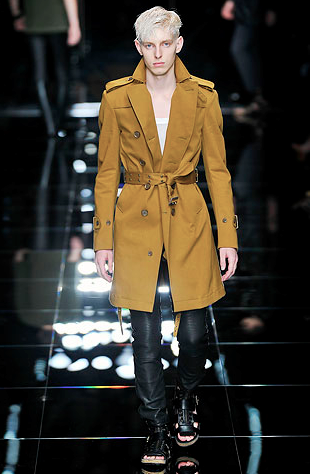 Burberry showcased amazing trench coats and aviator jackets. Gucci sticks to the Bohemian chic. 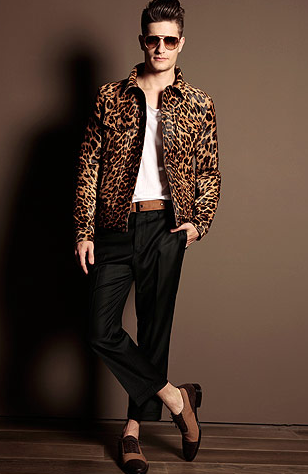 Trussardi does animal print mixed with Mexican ikats. Prada shines with bright colors. 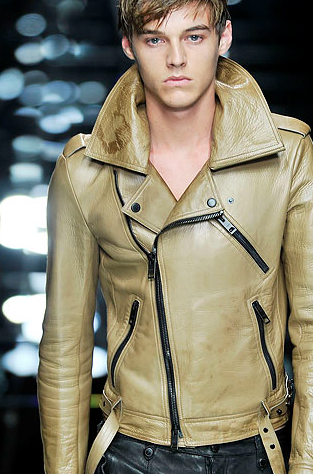 These designers set the trends for Spring 2011... simply the best. When I was 16 years old, my mother and I would go to Hong Kong and get all of my Trussardi, Gianni Versace, and Moschino. These household names are the go to brand in the 90s. Well! All of these labels evolved and are still successful. 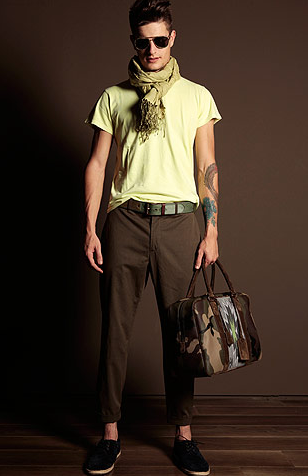 I am very surprised with Trussardi's Spring Collection 2011... very impressive. I love everything that Milan Vukmirovic for the house. The house is well known for using skins and transforming it into a beautiful garment. 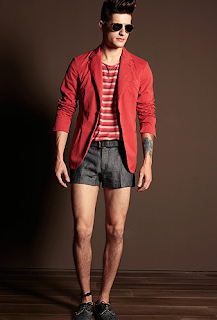 I believe that men who are confident about their sexuality should wear this collection. Are you brave enough to be chic? 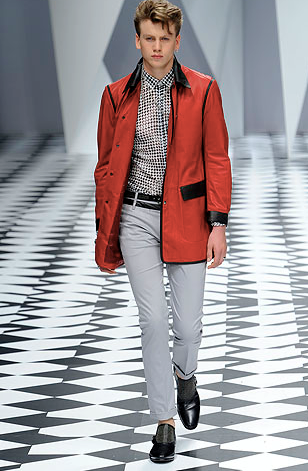 Trussardi is the collection to have. 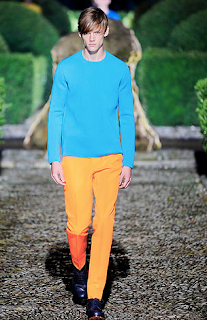 THE MEN OF MILAN BRIGHTENS UP!!! 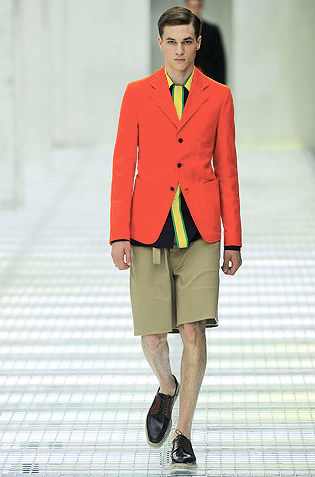 Prada and Jil Sander know how to set the trend for Spring 2011. These two fashion houses showcased bright colored ensemble on the runway. I cannot wait to get my hands on these amazing pieces. A couple of weeks ago, I found out that my favorite L'Artisan scent will be discontinued. What did I do? I started hoarding the last remaining bottles in New York. 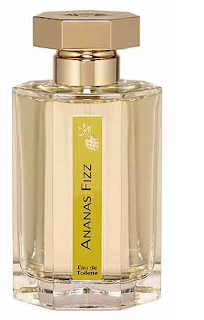 So far, I have 8 bottles of my favorite scent from the perfume company. I know they cost $135.00 a piece, but it is worth it. I like using fresh and citrus scent throughout the year. As you know, Mystery Man loves this scent on me. I know the rules when it comes in storing colognes... cold and dark places. I just came back from Barneys New York. I asked Howard to show me the shoes that were purchased for Fall. 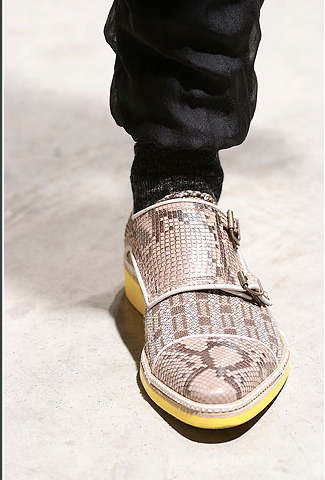 I was so bummed that they did not order my python shoes with yellow soles. When Mystery Man comes back, I will ask him to look for these shoes. He finds a way to get it for me. Last Thursday, Tinsley Mortimer attended the YSL Beaute launch party in New York. She wore a cocktail dress from Angel Sanchez's Fall 2010 collection. She paired it with purple python Jimmy Choo. Her hair is just phenomenal. It went well with the purple frock. Tinsley is slowly becoming a New York Icon in style. My good friend, Gillian, is part of the committee to raise fund for Haiti. She and our friends are going to have a small fundraiser at 10ak in West Chelsea, New York. The proceeds tonight's event will go to the victims of the earthquake tragedy in Haiti. I have known Gillian for 8 years. She has a good heart in helping the needy. Tinsley Mortimer was one of the presenters for the Fashion Fragrance Awards last Thursday at the Armory on 26th street. She wore an orange strapless cocktail dress from Oscar de la Renta. Earring by Mark Walsh and Leslie Chin. Naga Jewelry Ring by Wynn Wynn Ong. Shoes by Versace. Everyone wore black. Thanks to her colorful dress, she lightened up the whole event. I hope she gets a deal out this appearance. After all, she only deserves the best. Naga Jewelry designer Wynn Wynn Ong knows how to choose her muses. Last night, Tory Burch wore a cuff at the CFDA Awards. "Shabby Chic" was the choice for her beautiful printed dress. Rachel Roy is also a fan. She wore the same cuff to another CFDA event. Socialite Yaz Hernandez is an avid follower of Wynn's one-of-a-kind pieces. True enough, she is on the right track when it comes to accessorizing the right woman in New York. On June 9th, I will be styling the press presentation of Angel Sanchez's secondary line called SANCHEZ. This season, the designer will be collaborating with Kara Ross for jewelry and Stuart Weitzman for shoes. The event will take place at his showroom at 148 West 37th Street, 7th Floor from 6pm till 8pm. It is so easy to work with his team. Tinsley Mortimer knows how to put an outfit together. Last night, she was one of the guests of Piaget for the Inspirational Gala by AMFAR. The event was hosted by Kylie Minogue. She paired her Requiem dress with amazing Versace platform shoes. The simple Piaget pieces made her whole look complete. No wonder she is one of the stylist socialites in New York... not to mention famous in her own right.